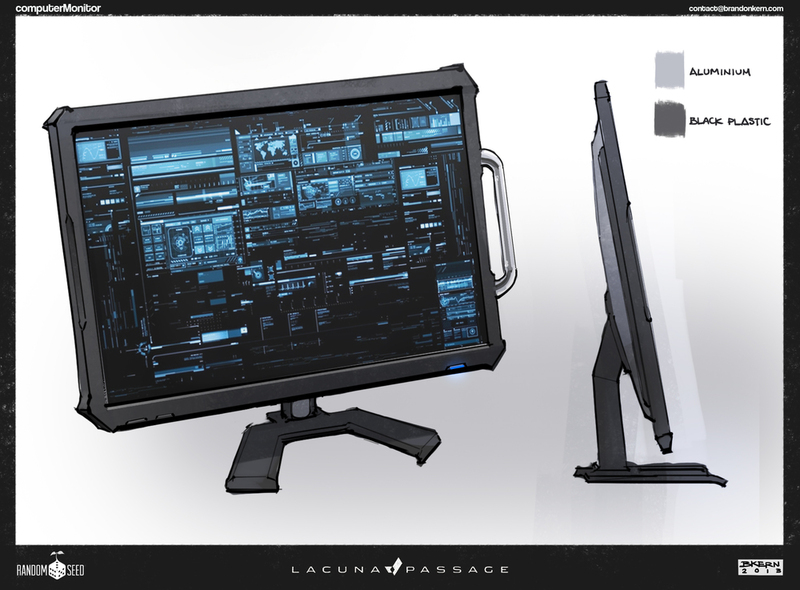 While we toil away on development of Lacuna Passage we thought we might give you a peek at some more concept art. We have really hit our stride with our art style, due in large part to our concept artist, Brandon Kern. Check out some of his work below. As we worked on bringing these concepts to life in 3D we realized that our equipment shader just wasn't up to the task. The normal maps were not as pronounced as we would have liked, and it was difficult to define strongly contrasting materials. Our models looked somewhat desaturated and ubiquitous across what should have been different surfaces. We set about creating a shader that would give us greater control over contrast and material definition (things like fresnel lighting, reflectivity, edge highlighting, and specularity). Below you can see the result of our efforts. It is now much easier to see the difference between surfaces like shiny plastic, dull metal, and rough rubber. This improved shader is still in testing since it was created using an alpha version of the upcoming Unity add-on "Shader Forge", but we are excited with the results and hope to utilize the eventual commercial release of Shader Forge. We've also been hard at work detailing the full-scale terrain that will be featured in the final game. Proper textures will be applied much later, but the massive heightmap is coming together quite nicely and should present the player with a wide variety of real Mars geographic features to explore. Check out a little preview below. Find out more about how we are creating our terrain in our previous devlog.